Today’s adventurers understand that the best watch for backpacking and hiking can be an essential tool. Let’s put this another way, bear with us: You’re totally free, outdoors. You’ve shed your civilized human skin, and now you are able to run through the wilderness and be at one with nature. Once you were known by another name, but today you can’t even remember it. Now you dive and hunt fish with the grizzly bears. You’re eating wild berries, tracking deer using only your senses, and catching snakes with your teeth. However, as you sit on the mountain peak howling with your new wolf sisters and brothers at the rising moon, you suddenly realize something. It’s Sunday, and the Game of Thrones premiere is on tonight. With this in mind, you quickly consult your watch and pull up the path back to your warm cabin with its hot shower, cold beer, delicious pizza, comfortable recliner, and a beckoning big screen TV. To accomplish this, you’ll want to put your fate in the hands of the best watch for backpacking and hiking. After all, why would you trust your life to anything less than the best? As with finding the best of anything, discovering the best watch for backpacking and hiking requires a bit of research. That said, there are certain features you need to look for before committing your wrist to a new gadget. The first feature you need to look for in a new watch is GPS. This lifesaving feature allows you to mark your entry into the woods and guides you back to that point. Some watches also have built-in barometers. This feature can warn and help you avoid incoming inclement weather. Durability is another important factor. 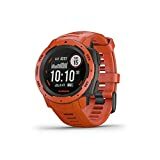 A hiking and backpacking watch needs to be able to withstand things like bumps, scrapes, cold, heat, dust, sand, and water. A watch made from the most durable materials such as stainless steel, carbon, and sapphire glass may not only protect your investment, but it could also save your life. Most importantly, you need a watch with a long battery life. You can have all the bells and whistles in the world on your wrist, but if your watch quits on you after only a few hours, it’s pretty much useless. Battery life is one feature of which you don’t want to settle for less. Our process for finding the best backpacking and hiking watch involved hours of research into internet forums, Facebook groups, and other social media platforms to see what experienced adventurers recommended. We then researched each model and eliminated watches with less than a certain customer rating. After we managed to find the top customer-rated watches, we then compared features, pricing, and warranties. Finally, we chose the watch with the best of all these criteria. We have eight contestants for the title of best backpacking and hiking watch. Each product has a unique design and great features. Additionally, the price points and warranties of each watch also vary. However, all of the watches on our list have the highest customer satisfaction ratios you’ll find among watches of their class. We also made sure that every watch had a GPS function, which we felt should be a standard feature for any hiking watch. Lastly, each model has a description of its features, customer reviews, pricing, and warranty information. The first entry in our best watch for backpacking and hiking contest is the Garmin Epix. This watch features a 1.4-inch high-resolution touch screen sunlit-visible color chroma display. It has eight gigabytes of internal memory. The connect IQ app allows you to customize your watch, choosing from a variety of data fields, widgets, watch faces and applications. Plus, you can automatically upload data to Garmin Connect, LiveTrack, and your favorite social media platforms using the Garmin Connect Mobile app on your smartphone. Additionally, smart notifications alert you to new emails, alerts, and texts. Lastly, it comes preloaded with a worldwide shaded relief basemap, plus your choice of TOPO U.S. 100K or TOPO Canada maps for greater detail. Amazon customers rated this product 4.1 out of 5 stars. One customer raved about the watch’s “trackback” feature which alerts you if you go off course. He also noted that the battery life seemed to last a long time. However, other customers were less than satisfied with this product. One customer claims that Garmin abandoned the product and was not issuing any more software updates. Another said the tracking feature was full of glitches. This product can cost from $$ to $$ and includes a 1-year limited warranty. The next entry in our best watch for backpacking and hiking contest is the Samsung Galaxy Watch (46mm). This watch features Andriod and iOS compatibility as well as Samsung Pay NFC compatibility, allowing you the option to pay in stores using your watch. It allows you to track everything from your appointments to the weather on a 1.3-inch super AMOLED touch-screen display with 360 by 360 resolution. It has a 22-millimeter silicone band that stretches for added comfort and military-grade durability. Additionally, you can wirelessly connect other smart devices using Bluetooth 4.2 and NFC technology for quick one-touch pairing. Best Buy customers rated this watch 4.6 out of 5 stars. One customer praised its great apps and ease of use. However, many customers complained that some of its tracking features were grossly inaccurate. This product can cost from $ to $ and includes a 1-year limited warranty. The next entry in our best watch for backpacking and hiking contest is the Garmin Fenix 5X Plus. This watch features a built-in heart rate monitor and color TOPO maps, featuring trend line popularity routing to help you plan the best hiking paths. It also has a wrist-based Pulse Ox Acclimation sensor which is a non-medical device that monitors and alerts you about your estimated blood oxygen saturation levels. That comes in handy when you are hiking in higher altitudes. This watch is stainless steel or diamond-like carbon (DLC) bezel plus a scratch-resistant domed sapphire lens. 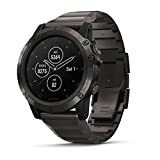 Additionally, it’s compatible with both iPhone and Android smartphones and features Garmin Pay, which allows you to link your credit or debit card to your watch for more convenient payment options. Lastly, it features battery performance up to 20 days in smartwatch mode and 13 hours while in GPS mode with music. Speaking of music, you can store up to 500 songs on your watch, and connect it with Bluetooth headphones (sold separately). Amazon customers rated it 4.2 out of 5 stars. One customer stated that he and his friends used the tracking and GPS features for all kinds of outdoor activities in the Colorado mountains. There were a few complaints, mainly concerning the software. One customer said that it didn’t work well with his iPhone. This product can cost from $$ to $$$ and includes a 1-year limited warranty. The next entry in our best watch for backpacking and hiking contest is the Fossil Men’s Gen 4 Explorist. 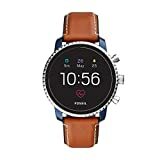 This watch features GPS, heart rate tracking, smartphone notifications, rapid charging, Google Play, touchscreen functionality, a microphone, multiple time zones, Google Assistant, and music storage and controls. Plus, you can customize goal, alarm settings, and watch faces. This watch is also swim-proof, has an estimated 24-hour battery life (based on usage), and includes a rapid charger. You can also add additional third-party apps through the Google Play Store. The Explorist runs on Google’s Wear OS and is compatible with iOS 9.3 plus and Android OS 4.4 plus smartphones. Lastly, it has Wi-Fi capability and Bluetooth. Amazon customers rated this watch 4.3 out of 5 stars. One customer said the GPS worked well outside, the strap was very comfortable, the display was bright and clear, and it offered a wide variety of helpful apps. However, there were a few complaints concerning the watch’s low battery life. Several customers claimed that it would run out after less than six hours. The next entry in our best watch for backpacking and hiking contest is the Suunto Traverse Alpha. This watch features a sturdy stainless steel bezel, water-repellent nylon strap, and strong scratch-resistant sapphire crystal glass. For hunters, there’s automatic shot detection technology that tracks where and when you shoot, creating GPS coordinates of your location which you can view later. GPS also can follow your path, creating a virtual breadcrumb trail. Additionally, it includes a location-based moon phase calendar with moon set and rise times to help you find the best hunting and fishing times. Amazon customers rated this watch 4.4 out of 5 stars. One customer praised the watch’s rugged look and durable materials. He also said that he tested the GPS feature in remote areas of West Virginia and it performed brilliantly. However, other customers had a few issues. One customer said the GPS ran down the battery life too quickly. Another complained that the “storm warning” feature was glitchy. This product can cost from $$ to $$ and includes a 2-year limited warranty. The next entry in our best watch for backpacking and hiking contest is the Garmin Instinct. 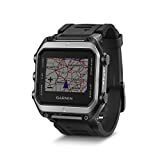 This rugged GPS watch is constructed using military standards for shock, thermal, and water resistance (rated 100 meters). It has an integrated three-axis compass and barometric altimeter, as well as multiple global navigation satellite systems (GLONASS, GPS, and Galileo). Plus, you can monitor your estimated heart rate, stress, and activity while training with preloaded activity profiles. You can automatically upload data to the Garmin Connect online fitness community and receive smart notifications from a compatible smartphone. There’s also a handy trackback feature that lets you navigate a return route all the way back to your starting point. You can even plan your trips using the Garmin Explore website. Finally, the battery life lasts up to 14 days in smartwatch mode, 16 hours in GPS mode, and up to 40 hours using UltraTrack battery saver mode. Amazon customers rated this watch 4.5 out of 5 stars. One customer said the battery life would last him over a week while using GPS frequently. He explained that it was the perfect watch for hikers and those who wanted a watch that could do simple tasks well. However, other customers disagreed. There were a few reports of the watch strap giving customers rashes. Also, there were a few complaints about software glitches. This watch can cost from $$ to $$ and includes a 1-year limited warranty. The next entry in our best watch for backpacking and hiking contest is the Suunto 9 BaroGPS watch. This watch features Suunto Intelligent Battery technology, which sends smart reminders based on your activity history to assist you in getting the most life out of your battery. It also advises you to switch to a different battery mode during exercise if your battery’s running low. Also, with endurance mode, you get 40 hours of battery life with built-in wrist heart rate tracking on, or 60 hours when paired with a Bluetooth® Smart heart rate belt (sold separately). This watch is compatible with either iPhone or Andriod. With Ultra mode, the watch takes less-frequent GPS readings, plus deactivates heart rate monitoring and Bluetooth connectivity, giving you up to 120 hours of battery life. Plus, you can program waypoints to create a virtual breadcrumb trail. It has scratch-resistant sapphire crystal glass with a stainless-steel bezel. Finally, it has built-in weather trend data, storm alarm, sunset, and sunrise times to help you plan your outings. REI customers rated this watch 4.6 out of 5 stars. One customer said it had terrific GPS accuracy, battery life, and a very user-friendly interface. However, a few customers expressed frustration with some of the watch’s monitoring apps like elevation and mileage. They said that the numbers were usually not accurate. This product can cost from $$ to $$$ and includes a 2-year limited warranty. The final entry in our best watch for backpacking and hiking contest is the Casio Men’s “Pro Trek” Resin Outdoor Smartwatch. This watch features Andriod Wear 2.0, GPS, a full-color map display, and allows you to download map data for offline use. You can also save your current position using Location Memory. Furthermore, you can write memos on the map. It’s compatible with Android and iPhones. Plus, it has built-in quad sensors which provide real-time notification of tracking, barometer, altimeter, and compass readings with no phone required. Amazon customers rated this product 4.0 out of 5 stars. One customer said that the watch had great tracking apps that are perfect for a wide variety of outdoor activities. However, the same customer complained that the battery doesn’t last more than 12 to 14 hours if you leave GPS turned on. Our pick for the best backpacking and hiking watch is the Garmin Instinct. This watch has every feature that a modern outdoor adventurer would ever need. While it doesn’t have all the bells and whistles of the Gamin Fēnix 5X Plus, it does have all of the essential features you need to have. Its extra-long battery life and multiple global navigation satellite systems make this watch our top choice. We hope you’ve found this information helpful in your search. Good luck to you, and happy trails.